Surname: BASS | Type: Burial | First Name: SIDNEY | Date of Death: 15/11/1909 | Location: Presbyterian Monumental | Section: F | Position 0027. A double drowning fatality occurred at Cronulla Beach, near Sydney, last week. Two brothers, Sydney and Hubert James Bass, recent arrivals from Buckinghamshire, England, proceeded for a bathe from the shore at The Oaks Point. 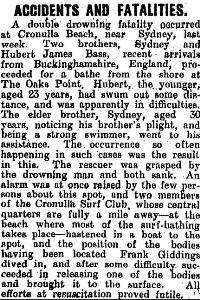 Hubert, the, younger, aged 23 years, had swum out some distance, and was apparently in difficulties. The elder brother, Sydney (sic), aged 30 years, noticing his brother's plight, and being a strong swimmer, went to his assistance. The occurrence so often happening in such cases was the result in this. The rescuer was grasped by the drowning man and both sank. An alarm was at once raised by the few persons about this spot, and two members of the Cronulla Surf Club, whose central quarters are fully a mile away  at the beach where most of the surf-bathing takes, place  hastened in a boat to the spot, and the position, of the bodies having been located Frank Giddings dived in, and after some difficulty, succeeded in releasing one of the bodies and brought it to the surface. All efforts at resuscitation proved futile."